Let these poems about regret remind you not to live a life full of regret. May the verses motivate you to continue to move forward and not look back with regret - life is too short! we immediately realized was not the right thing to say? on an event and think, if only I had. . .
that we wish hadn't done? You can't change what has been said. You can't change a past event. You can't change what has been done. Do you relive an event the way it should have been? Forget about regret, and focus. Focus on today, not on the past. The only thing to feel sorrow for is not living each day to the fullest. The only thing to do to repent is to sincerely say, I'm sorry. 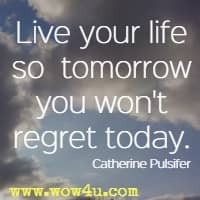 Don't live your life regretting yesterday. joy, fun, and laughter as you can stand. From day to day, from year to year. He found he had already died. "Don't wait until retirement to live your life." There is only one thing about which I shall have no regrets when my life ends. I have savoured to the full all the small, daily joys. Sunday evening tea before the fire! not ever taken it for granted. Spring, summer, autumn, or winter. I wish I had failed as little in other ways. to test decisions in your life." As long as we are learning it's not dumb. Looking back in regret is not what you need. Don't look back thinking it was bad. Learn and move on you will be better yet! "Don't allow yourself to become one who, nearing death, regrets what you might have done if only you had taken a few risks We each have a purpose in life." Have you ever been parted from the one you love so dear? Have you felt so desperately alone? Nor anything you see or what you own? Yet all of this has not made life complete. And never noticed life was slipping by. Your love was gone, your heart was hard and dry. The time to see the precious love you shunned. You never put a thought into that fund. Your family stepped aside; you had your way. A stark reminder that you'll face each day. Too late you realized the things you missed. So much at stake and you could not resist. Perhaps you're ready now to make amends. It's there that joy begins and misery ends. "If you want to have no regrets in life, you will ask older and wiser people to share the best lessons they've learned so you can use them in your life."